B U B B L E G A R M: DIY Bangle! Today I went fabric shopping and also had a little shopping trip to accessorize, needless to say I didn't buy anything, but I was inspired! This is a perfect way to re use a bangle your not in love with to make it one that you adore! 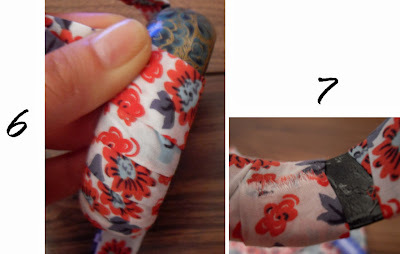 To make this you will need: Fabric, an old bangle, prit stick, all adhesive glue, and some scissors. Let's get started! Click images to enlarge to get a closer look! 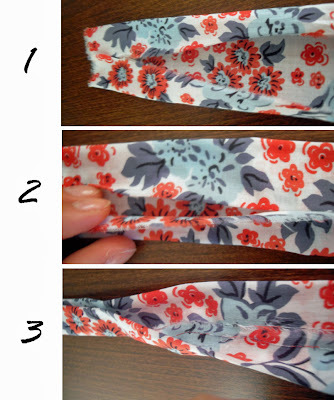 1) You will need to cut a long piece of fabric and fold it on either side to make it meet in the middle. 2) Glue it down with prit stick. 3) Fold it in half and glue it with prit stick so you have a clean edge. You should have something that looks like this at the end of those steps. 4) Next apply some all purpose adhesive to your bangle. 5) Press the edge of your fabric down, holding for a few seconds unti it's firm. 6) Wrap tightly all the way round. 7) Glue down with all purpose adhesive when you get to the end, my strip wasn't long enough. 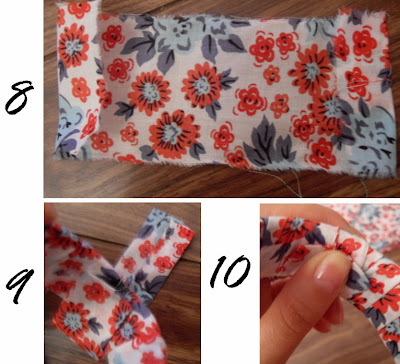 8) cut a small rectangle and fold in the edges, and then complete steps 1, 2 and 3 again until you have a small strip that is clean on all ends. 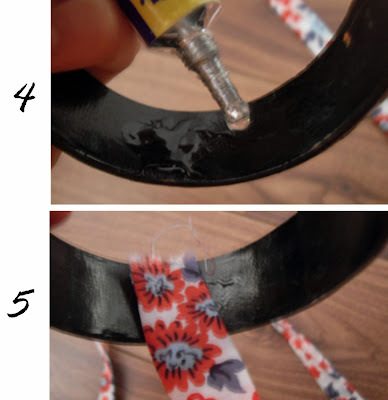 9) Apply all purpose adhesive to the inner part of bangle again and add the small strip of fabric to it. 10) Wrap it round and stick it down again, holding until dry. How cute does it look? The best thing about it is, you can make a top, skirt or dress from the leftover fabric and have a matching bangle! Did you like this post? Would you like to see more "Do It Yourself" ideas? wow loving it!! such a pretty fabric as well!! Lovely! And yes, definitely, I will love some DIY entries. They are inspirational and I love crafty things. The detail of having a bangle matching a dress is awesome. Take Care! that is sooo pretty. yes would love more DIY blogs enteries please. Love these kind of posts! and the colours of the fabrics are beautiful! LOVEs it, 2 thumbs up! omg! SUCH A GOOD IDEA!! i have some useless bangles that i need to work on now.. haha thanks, girl! yes, post more DIY posts, pls! You are so creative.... I love it!!! omg!! I need to do this... GOOD IDEA and yes yes yes more DIY! I love this!! That is such a good idea! I've seen bangles wrapped like this in cloth, but never thought of doing it myself. I'm going to go fabric shopping! haha I would love to see more DIY posts!! SOOO Cute! I love DIY stuff! Great pattern too! I love this! Such a great idea! Wow, you're so creative! Of course we wanna see more DIY posts! wow! thats such a good idea! its so on trend aswell! i love your posts like this, you should do more, there great! That's a great idea and looks fairly easy to do!!! Needless to say the bangle looks quite expensive! I really like these kind of posts! More like this would be great. What a great idea! The fabric is so pretty! I love this kind of posts, keep them up! I LOVE IT!!! I have to do this!!! Thank you for the post!!! Looove loove this post! please do more of D.I.Y. :) THANKS! loves this! would love some more! I love this post! I'd love to read more DIY themed posts. Ohh what a great idea!!! love the bangles and the headband you've made.